Humans have been "acquiring" infectious diseases from animals (zoonotic diseases) since we first started hunting wild game on the African savannahs. Indeed, nearly 60% of bugs that infect humans originated in animals. These days, we seem to see more "new" diseases, such as Zika, Ebola and SARS. But there are plenty more lurking. A recent study suggests there are around 300,000 pathogens we don't even know about and some have the potential to spread from animals to humans. The world's scientific community is focused on how to improve detection and responses to emerging diseases such as Zika virus and Ebola. So what can we learn from the most recent large-scale outbreaks? poor population health and health services. These factors are often interlinked and can turn a small "spillover" outbreak from animals into a major epidemic, as seen in the most recent Ebola epidemic. Essentially, humans put themselves in harm's way just by going about their daily business of growing or harvesting food and seeking shelter. Ebola is caused by a virus thought to be carried in fruit bats that spills over into other mammals such as primates and antelope. Humans are infected when they hunt or butcher animals for food or consume uncooked fresh or dried bushmeat. Human-to-human transmission involves close contact with bodily fluids. This often happens in health-care settings and when people care for sick relatives or perform traditional burial practices that involve direct contact with bodies. 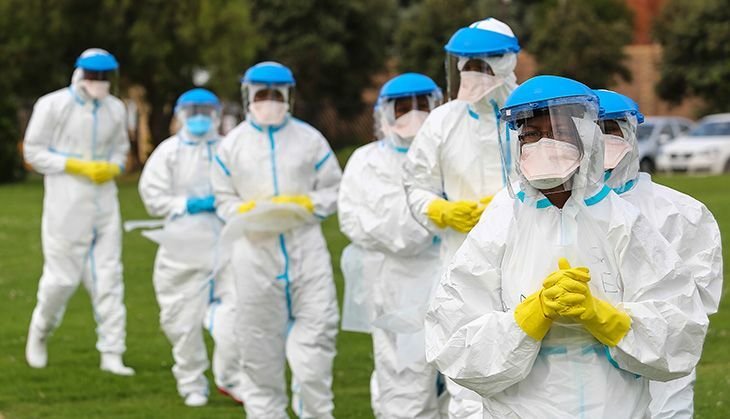 The 2014 outbreak in West Africa, which caused more than 28,000 infections and 11,000 deaths, was a sudden departure from the usual picture of small, localised outbreaks in remote areas because of a "perfect storm" of factors. The war-torn countries involved experienced a dramatic increase in population growth, high levels of urbanisation, increases in agricultural production (especially livestock) and associated changes in land use and land clearing. On top of that, they had very few health services (reportedly just 50 doctors in the whole of Liberia), especially in rural areas. This combined with the widespread consumption of bushmeat, traditional burial practices and rapid transport networks to drive the outbreak. It's not hard to see why the spread from rural areas to cities occurred so rapidly; where else would people go for help? Severe acute respiratory syndrome (SARS) was the defining emerging disease of the 21st century. Caused by a highly infectious coronavirus, it was a global shock which demonstrated how quickly diseases can spread around the world. The spread of SARS was greatly accelerated by geography. It was first detected in Guangdong Province in China but it spread from nearby Hong Kong via a vast network of international air travel. The natural host of SARS is thought to be bats. But the jump to humans occurred via the palm civet, a small omnivorous mammal. Civets are a delicacy and eating them is a sign of wealth in Cantonese culture. At the time, civets were slaughtered for local consumption at restaurants specialising in wild game. One of the first cases was a cook in Shenzen. The live animal markets bring together a bewildering array of animal species and are critical junctures between rural and urban communities. This is where one-third of cases originated. Zika virus is the latest emerging disease to hit the news. It was first isolated from a rhesus monkey in the Zika forest of Uganda in 1947 by scientists studying the closely related yellow fever virus. Like its relative the dengue virus, Zika's usual cycle of mosquito-monkey-mosquito expanded to include humans when we entered their ecological niche to collect food or for shelter. The human disease caused by Zika had remained largely invisible since its first identification in 1954. Its recent "emergence" may just be a response to its higher profile after the discovery that infection during pregnancy is associated with the birth defect microcephaly, which causes babies to be born with unusually small heads. Zika virus will continue to quietly spread around the world via air travel and establish in more countries because its mosquito carrier, Aedes aegypti, is present in more than 128 countries including parts of Europe, the United States and Australia. Why did these diseases jump species? The common theme in the spillover of each of these viruses is food; they are a consequence of the human need for protein. Once the viruses make the species jump, their severity is a major factor in what happens next. It is easier for a mild disease such as Zika to spread unnoticed in a population because it is unlikely to lead a person to seek medical attention. When disease is severe (think rapid hospitalisation and death), such as Ebola or SARS, it tends to make itself known more rapidly, triggering an aggressive public health response that can lead to suppression of the outbreak. The rapid spread of SARS by international air travel to wealthy countries with effective public health systems was a major factor in its limited duration compared with Ebola, which largely remained in a limited geographic range. Ebola may well have become a global pandemic if it had occurred in a major international transport hub. The world will not prevent the next global pandemic using "business as usual" thinking. We need to acknowledge we live in a rapidly converging world where solutions cross all sectors of society. Major cross-sectoral initiatives, such as the US government's Emerging Pandemic Threats program, are making some progress. This program attempts to create national, regional and global "One Health" networks" to reduce the risk of disease emergence and improve our ability to detect and respond to these unpredictable beasts. But this is not enough because the emergence of diseases is largely driven by changes in human societies. The only thing that will change the drivers of disease is a fundamental rethink about how we co-exist with our environment. Unfortunately, there are no easy answers to how we build and feed a global community of 9 billion and not cause an emerging disease disaster along the way. This is the third and final article in our disease evolution package. Click here to read the first: Disease evolution: our long history of fighting viruses and second instalments: Disease evolution: the origins of anorexia and how it's shaped by culture and time.